Enter the world of organ transplantation and develop a new understanding of processes and techniques for working effectively with patients in this increasing medical population. This multidisciplinary overview of organ transplantation contains chapters by major figures in the medical arena, internationally known bioethics writers, and experienced chaplains from the clinical setting of transplantation, as well as respected pastoral theologians. The authors, who include Art Caplan, Donald Capps, and Jack Copeland, explain transplantation completely for the nonmedical person and delve into the myriad ethical and religious issues and controversies surrounding organ donation and transplantation. Enlightening chapters clarify issues and help readers better understand the transplantation process, making them more effective in their work with transplant patients. 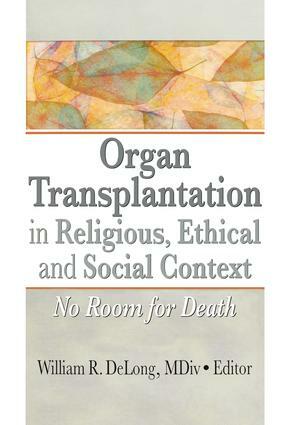 Organ Transplantation in Religious, Ethical and Social Context is divided into three sections. The first emphasizes transplantation as a team effort. Chapters focus on the various roles of chaplains and other team members. Section two addresses ethical questions which arise from transplantation and organ donation and includes interfaith perspectives. The third section is dedicated to theological and pastoral views concerning transplantation. Hospital chaplains, transplant social workers, transplant coordinators, and other professionals interested or involved in the process of organ transplantation will find this book to be full of interesting and thought-provoking insights and information. Are There Any Limits to Scarcity?